"By the time this reaches you, I will with God’s mercy, have joined in Heaven my father and mother as well as my dear friends who have been shot during the week. I have priests with me almost constantly in the past 24 hours. One dear old friend of mine, Dr Paddy Browne of Maynooth stayed with me up to a very late hour last night. I feel a happiness the like of which I never experienced in my life before and a feeling that I could not describe. God bless and guard you all and my the Lord have mercy on my soul". Fr. 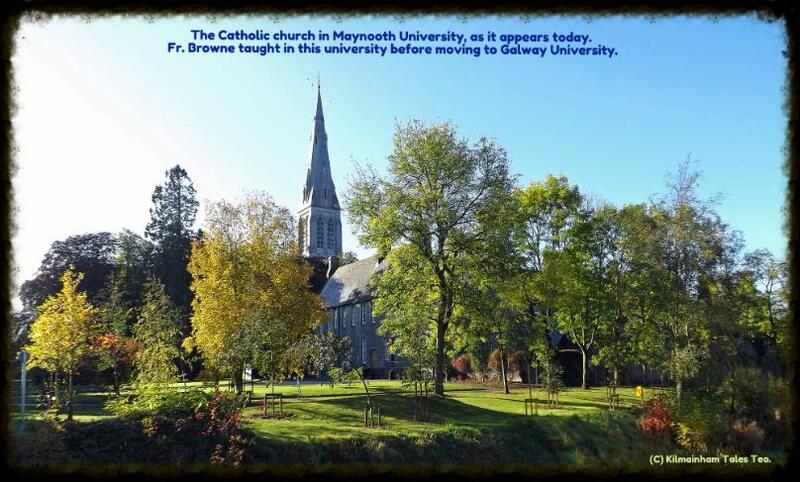 (later Monsignor) Patrick Browne was President of University College, Galway when he wrote his Witness Statement (number 729) in 1952. He was a close friend of MacDermott, as well as the Ryan family of 19 Ranelagh Road in south Dublin. Mary Kate (Kit, she married Seán T. O’Kelly, but the couple had no children), Ellen (Nell, who never married), Mary Josephine (Min, who became Mrs Richard Mulcahy and had six children), and Phyllis (who became Seán T. O’Kelly’s second wife two years after her sister’s death, but they, too, had no children). At the time of his execution, MacDermott had intended to become engaged to Min Ryan. Though it would seem that the Rising would be a common topic at the Ryan home, Browne wrote that it was never discussed when he was a guest at the house, and he was completely surprised when the Rising erupted. Still, Browne wrote, he became very friendly with MacDermott, also meeting him at the office of Irish Freedom where MacDermott worked, and at the The Bailey Pub on Duke Street. "He would just come in there like anyone else, just coming for a drink or a smoke. All conversation was of a general nature and had absolutely nothing to do with the Volunteers. Of course, we talked about the war and generally about England, but nothing about the party. At no time did he give me any inkling that there was anything serious in the wind. There was a feeling, generally voiced by Sean T. O’Kelly and other people, that they would not like to let the world war pass by without a blow being struck, but it remained on a general level". Fr. Browne was at his Mother’s home in Tipperary during Easter Week, and upon his return, he immediately went to the Ryan home. He found that Jim had been in the GPO and was in prison. Although Kit and Nell had taken no part in the Rising they were both imprisoned also. Phyllis and Min brought food and messages to the GPO but were not in jail. Later Min escaped arrest and was sent to the US to coordinate with John Devoy and Clan na Gael. Both Min and Phyllis went to see MacDermott when he was in Kilmainham. Then Browne went to Richmond Prison and Arbour Hill to see MacDermott. Finally MacDermott was transferred to Kilmainham Gaol so he went to see him there also. Browne later recalled that MacDermott was to be executed on the day before he was actually executed. MacDermott’s sentence was read to him and he was to be executed on the 11th. Browne remembered that Min Ryan had gone to see him and when she came back to house she told Browne then that it would be a good thing if he went to see him, that he was to die the next day. "I was brought up then. A soldier led me up and opened the cell door. I went in and he locked the door. The guard was passing up and down outside and he let me alone. The queer thing about my visit there was that I was to be left for an hour and a man would come and take me away at the end of that hour. It was when I was there that the telephone wires got busy as a result of John Dillon’s speech in the House of Commons - it must have been - Asquith got the military authorities in Ireland to stay their hand and postpone the execution". Browne surmised the Gaol was thrown into turmoil, and as a result he was left alone with MacDermott far longer than he had permission to stay. Browne recounted it was “the small hours of the morning [11 May] when I left”. Browne said the Gaol commander was distressed that he was still there: "I would take it as a favour if you would say nothing about being left here so long" he said. "He brought me down, going into his office, and he told me to be on my guard during curfew while cycling home and to be sure to stop any time I was challenged by the sentries. I had a drink with him and left on my bicycle. He did not think there would be any more executions and showed great relief at that". Browne said they talked about the Irish Volunteers and about the question of how Browne did not know anything about the Rising. Browne said MacDermott “was absolutely certain that I would know and that sufficient hints had been dropped in conversation all the time for anyone to pick up. I said I did not, that my mind had not turned on it at all”. Conversation also turned to the "Castle Document”. (The "Castle Document”, printed and disseminated in Dublin on 13 April 1916, alleged that the Dublin Castle authorities proposed to arrest many important and well-known public figures, and to raid the business premises and residences of them and several other persons, including the residence of Dublin Archbishop William Walsh. This became known as “The Castle Document" and was read to the Dublin Corporation by Alderman Thomas Kelly. Kelly was very well respected so the document was believed, but most now think Plunkett had forged it). Browne recalled MacDermott saying of the Document: "He said that it was an absolutely genuine document. Although it was his last night on earth and he spoke with great conviction, I found great difficulty in believing it. That would have been about the most important item of our conversation, as far as history is concerned. Otherwise it was just as any conversation we might have had in Mrs. O’Kelly’s [Kit Ryan] or the night he was in Maynooth". During that visit, Browne and MacDermott also talked about the countermanding order of Eoin MacNeill. (When MacNeill determined that the arms ship the Volunteers were counting on was captured, MacNeill issued his order canceling all maneuvers on Holy Saturday night). world reverberation than that week’s fighting in Dublin. I think he felt very bitter about the calling off. As a matter of fact, he was not wasting time talking about that. He said what a pity that it prevented the Rising being a respectable Rising, that it would have been over a considerable part of the country, employing a lot of British troops, and that, as far as the Germans were concerned, it would have been a more valuable thing than the mere flash in the pan it was. I don’t think he even referred to McNeill as a person beyond the fact that he considered it a shocking disappointment that it had not come off as a Rising". Browne regarded MacDermott as a marvelous young man who lived for the insurrection, and he felt that he had no regrets about the Rising or that he was to die. Browne went back to Kilmainham the next night, and again spoke at length with MacDermott. Seán MaDermott was executed in the Stonebreaker’s Yard in Kilmainham Gaol early on the morning of 12 May 1916.